Some things, one writes because one has something one wants the world to know. Some things, one writes because, despite one’s better judgment, one can’t help it. This is one of the latter type. I have a recurring dream. I mean this in the most literal sense possible. I do not mean that I have an aspiration, or a hope. This is literally a dream that I’ve had, while I was asleep, multiple times. I’m not really sure why, since the apparent stimulus that this dream is responding to is many, many years in my past. Nevertheless, I have had it 3 or 4 times now. There’s a man driving a pickup truck along a highway near open plains. Intercut are images of him driving a tractor over an apparently endless field, shot from a fixed 3rd-person perspective behind the tractor, driving towards the horizon. Close up of his face. He looks bored, resigned. He sees a falling star streaking down from the sky. 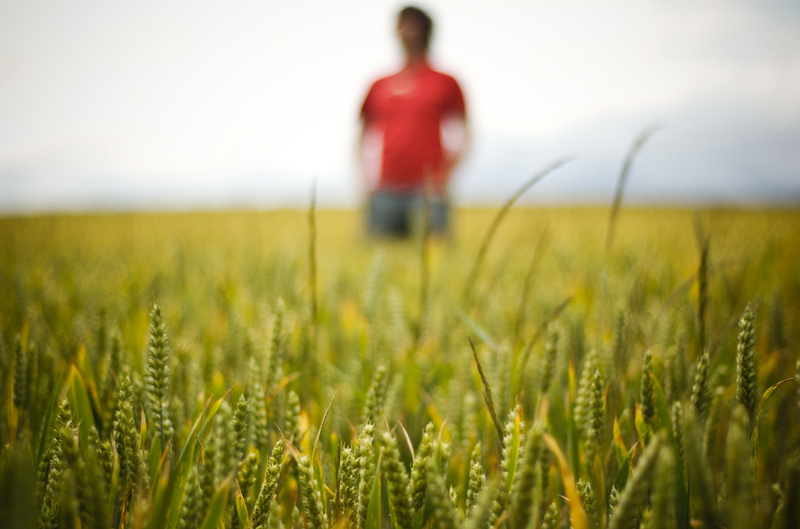 As he watches, there’s a roaring noise, and a boom, and it crashes down into an adjacent field. Cut to him cautiously exploring the crash site. There’s an object in the middle of the crash site, still glowing red hot. It’s a strange shape; conical, about a meter long, but with an indentation on its side and various protrusions, one of which looks like a human-sized handle. Another cut, now he’s inside the truck again, and we can see that the object is under a tarp in the back of the truck. Now he’s in his garage. He’s wearing a red work shirt and blue jeans. The object is hoisted up on a lift, and he’s walking around it, examining it. A prolonged sequence of him trying to cut it open with a plasma arc cutter, then wiping off the smudge to reveal it’s still shiny. Finally, he lowers the lift, but as it goes towards the ground, the object beeps and stops dropping, at about waist height. It slowly rotates, swiveling to point towards the open garage door. He walks over to the object and stands next to it, his hip near the indentation in its side, and he reaches out to grab the handle. The machine makes a powering-on whine and more protrusions start folding out of its sides; he yanks his hand back like he’s been burned, and it folds back into itself. More cautiously this time, he reaches out to grab the handle. Before the man has a chance to the react, the indentation in the side of the machine extrudes several parts of a metallic harness which surround his body. A thruster on the back part of the machine starts glowing a dull red color, and then the machine (with the man in tow) shoots out of his garage. Initially, he is running furiously to keep up. He trips over a rock in the road, but the harness allows him to sort of gyroscopically spin while still attached to the machine, and then right himself again. Eventually he pulls back on the handle and he’s flying through the air, and then the protrusion on the nose of the machine shoots a beam in front of him and opens a portal, which he then flies through. The machine says “Welcome to the fantasy zone.” and then “Get ready!” again, and then we see a montage of him flying over alien landscapes, primarily plains checkered in garish primary colors, shooting giant plasma bullets out of the nose of the weapon at trees, tiny fighter jets, rocks, and basically anything that gets in his way. There are scenes of him talking to giant one-eyed mammoths, and a teaser-trailer shot of giant, horrible looking two-headed dragons. 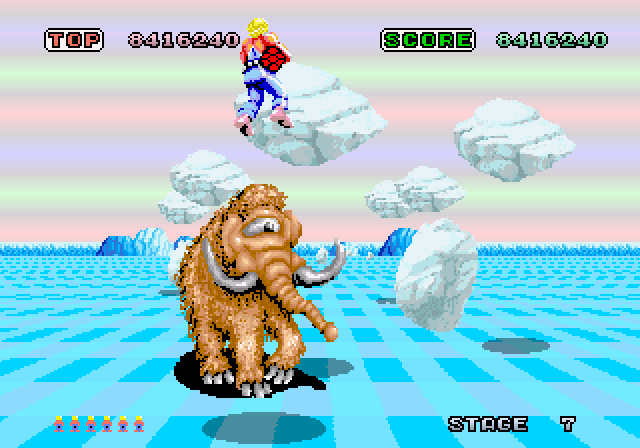 COMING THIS SUMMER: SPACE HARRIER, THE MOTION PICTURE. Sega: please, please get someone to make this movie. The dream is only ever the trailer, and I really want to see how it ends.